While mining operations extract precious minerals and metals from below the earth’s surface, the operations depend on something also very valuable that is above the ground: off-the-road (OTR) tires. Mining-site managers are only too aware of how dependent their operations are on the maintenance of the special OTR tires used by earthmoving machines and haul trucks. Something as simple as a sidewall puncture on one of these specialty tires, caused by a rock or haul-road debris, can temporarily take a critical and expensive operating asset out of use. This can negatively impact mining operations workflow. Moreover, replacing an OTR tire can cost in the tens of thousands of dollars. The environment in which dump trucks, wheel loaders, motor graders and other heavy mining equipment operate is severe even on the toughest of tires. It takes significant skill for a driver to navigate within a mine and get in and out of a site quickly and safely with minimal wear and tear on their tires. Haul roads are heavily travelled, are often narrow, contain short and steep grades, and have ruts and rock debris. Even though OTR tires for heavy equipment are specially designed for harsh environments, the risk for damage is still high. One of the most common failure points is the tire’s sidewall. Without any added protection, a tire’s sidewall is exposed to rocks, debris, uneven road surfaces and high bank faces, all the while supporting heavy payloads. Research by the Mechanical Engineering Department at the University of Alberta in 2011 on the detection of faults on off-road haul truck tires identified five tire failure areas: tire tread, shoulder, sidewall, bead and liner. The study cited research by Syncrude Canada Ltd. that examined the causes for off-road tire failure from 2005 to 2010. Sidewall cuts accounted for approximately 18 per cent of all faults, sidewall separation 10 per cent and sidewall impact over five per cent. An innovative new sidewall protection solution is entering the market to protect these valuable OTR tires. 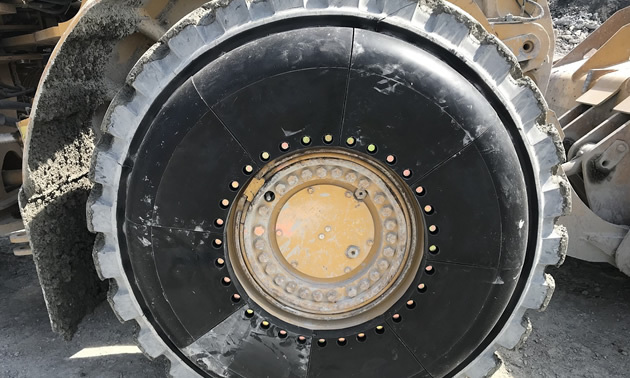 Purpose-built for use on heavy equipment operating in mining environments, a polyurethane sidewall shield can be bolted on to prevent the sidewalls from getting punctured when operating in a mining site. A Michigan-based firm, Argonics specializes in high-performance, polyurethane-based elastomers and is one of the largest producers of wear-resistant and customizable urethane products. It has developed a sidewall protector using a proprietary urethane formulation called Kryptane, which was engineered for extreme wear conditions involving abrasion, sliding or impact. Urethane offers maximum abrasion resistance, which is ideal for situations where severe wear is a problem. It is also already hard at work in mining applications withstanding abrasive ore, sand and gravel moving through a conveyor. The sidewall protector comprises eight integrated segments that—together with a specially designed ring—use 32 bolts to apply to a wheel. The entire sidewall protector can be installed in about 15 minutes once the special flange has been installed by certified personnel. If an individual segment is damaged, an operator can replace just that piece, saving the cost of replacing the entire shield. Virtually no maintenance is needed other than to retorque the bolts after 15 to 20 hours of use, much like when installing new tires on a car. According to Fell, who has been overseeing product testing, the urethane-based sidewall protector has been tested for over eight months since 2017. It has been installed on the front tires of a Caterpillar 980, a seven-cubic-yard loader. The loader has been working in a quarry face with blasted rock in a site located in Ontario. “The sidewall protector has been performing very well,” said Fell. “We’ve had no tire punctures or sidewall issues since installing the protectors.” According to Fell, the quarry is a harsh environment on the tires as there is contact with very abrasive material from small particulates up to 60 centimetres in size. Fell estimates that the cost to replace tires on the loader would be up to $12,000 for a new tire or up to $6,000 for a used tire. According to Welker, the patent-pending urethane sidewall protector is currently in its fourth generation, and the company is preparing to make the sidewall protector available to the market shortly. Currently the design is based on a 25-inch-diameter wheel used by loaders such as the Caterpillar 980. The company is planning a sidewall protector for a 45-inch-diameter wheel next. For more information, visit the Argonics website at www.argonics.com.